Bus from Sungai Petani to Kuantan is the most efficient and economical transportation option to travel from Sungai Petani to Kuantan. Kuantan I mostly well-known for its beaches along its long coastline. Therefore, many tourists and locals like to visit Kuantan especially during holiday season. Some students also rely on the bus service to go Kuantan for further study from hometown Sungai Petani. Utama Express is the one and only bus operator offering bus from Sungai Petani to Kuantan. Utama Express only provides 1 daily departure from Sungai Petani to Kuantan. The departure time is at night 8:45pm. Utama Express is one of the most reputable and influential bus operators based in Kuantan. To ensure the safety of the passengers, Utama Express also installed GPS system and speed limiter for their coaches. Hence, passengers can travel safely and worry-free with Utama Express bus. 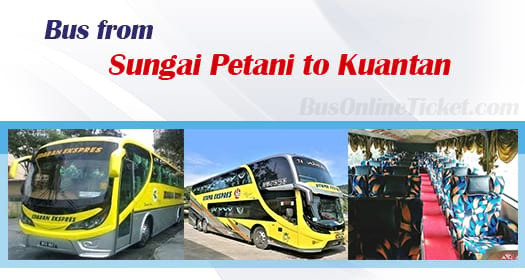 The bus journey from Sungai Petani to Kuantan takes about 9 hours depending on the road traffic condition. The operator is serving the route with double deck VIP coach in order to bring comfort to passengers during the long hour journey. Washroom break will be given along the highway. Additional break will be given upon request from the driving during the journey. The bus ticket price from Sungai Petani to Kuantan costs reasonably at RM 59.60. The pick-up point is located at Sungai Petani Bus Terminal. Upon reaching Kuantan, the bus will terminate the service at Kuantan Bus Terminal. BusOnlineTicket.com is the most reliable and secure online ticketing system in Malaysia and Singapore. With internet access, you can always book bus tickets from Sungai Petani to Kuantan online anytime, anywhere, and any place. Instant confirmation email will be sent to you upon payment is successfully received.